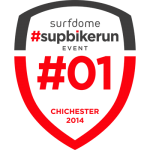 Surfdome presents #supbikerun – a new breed of triathlon. Our 1st event was set just outside the historic city of Chichester and within the South Downs National Park. The event commenced on a 40 acre freshwater lake with a 3K SUP (stand up paddle boarding). From the lake, the transition was made to your mountain bike to explore a stunning 30K loop passing the Goodwood Motor Circuit, across the West Dean Estate and then finally up and over Kingley Vale (an ancient yew forest with leg biting hills)…twice! The event concluded with a gentle 5K trail run to warm down and complete the adventure. All events are chip timed and each participant received a #supbikerun goodie bag at registration which included products from Specialized, Vita Coco, Natural Balance Foods and a #supbikerun T-shirt. Upon completing the event a #supbikerun finishers medal was awarded.